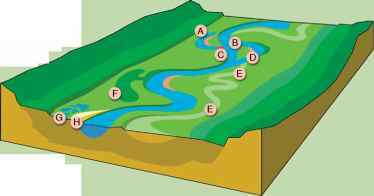 Figure 4 Topographic features of a meandering stream or river on a floodplain. Modified from Loucks DP and van Beek E (2005) Water Resources Systems Planning and Management. Paris: UNESCO. Figure 5 Typical changes in the stream characteristics along its length. Modified from Loucks DP and van Beek E (2005) Water Resources Systems Planning and Management. Paris: UNESCO. wider and more complex floodplain and larger channel than Zone 1. The lower gradient, larger stream size, and less steeper terrain in Zone 2 often allow more agricultural or residential development. This development may restrict the diversity of the natural plant communities in the middle and lower reaches, especially when land use involves clearing and narrowing the corridor. Such actions alter stream processes involving flooding, erosion/deposition, and import or export of organic matter and sediment. This affects stream corridor geomorphology, habitat diversity, and water quantity and quality regimes. 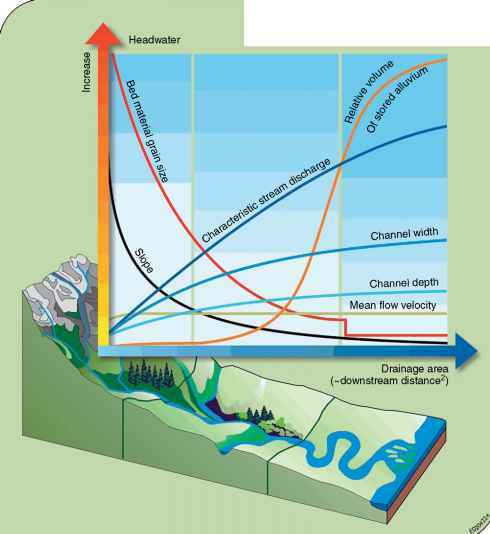 The lower gradient, increased sediment deposition, broader floodplains, and greater water volume in Zone 3 typically lead to different plant communities than those found in the upstream zones. Large floodplain wetlands can develop on the flatter terrain. The changing sequence of plant communities along streams from source to mouth is an important source of ecosystem resiliency. 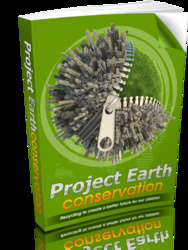 A continuous corridor of native plant communities is desirable. Restoring vegetative connectivity in even a portion of a stream will usually improve conditions and enhance the ecosystem's beneficial functions. Stream biota are often classified in seven groups: bacteria, algae, macrophytes (higher plants), protists (amoe-bas, flagellates, ciliates), microinvertebrates (such as rotifers, copepods, ostracods, and nematodes), macroinvertebrates (such as mayflies, stoneflies, caddisflies, crayfish, worms, clams, and snails), and vertebrates (fish, amphibians, reptiles, and mammals). 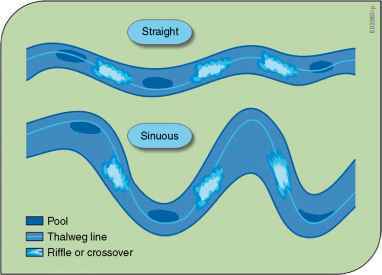 Figure 6 Sequence of pools and riffles in straight and sinuous streams. Modified from Loucks DP and van Beek E (2005) Water Resources Systems Planning and Management. Paris: UNESCO. temperature, streamflow and flow velocity, substrate content, the availability of food and nutrients, and predator-prey relationships. These factors are often interdependent.